What happens when a major event hits your organisation? Whether your organisation is small or large, there are certain situations where you have to take action in order to prevent damage to either the company, shareholders or customers – or all three! WHSmith in the UK have been hit by a crisis. It was brought to their attention through an investigation by The Kernel that e-books of a dubious (and possibly illegal) nature were available for purchase through their website. The story broke on Friday and spread to various other news sites during the weekend, with much of the initial focus on another affected retailer, Amazon. Eventually on Sunday WHSmith responded in the most drastic and dramatic way possible. They took down their entire website. I’ve been through a number of corporate crisis situations during my years as a web manager. They are stressful, demanding, and require quick, hands-on action by a number of individuals. There are relatively few situations (unfortunately) when so many members of management have such an interest in the digital side of things! The situation WHSmith found themselves in is relatively odd. Normally, at least in my experience, crisis are driven by external factors – an accident, natural disaster, a product problem. WHSmith indeed had a product problem; but not one where a physical product was found to be dangerous or faulty. WHSmith had digital products available on their website that needed to be removed, and removed quickly once they had been made aware of the situation. WHSmith’s problem products were e-books fed to them from Kobo. WHSmith receives a feed of e-book titles and syndicates those on their e-commerce site. This is not unusual. In WHSmiths case they were publishing this feed largely unfiltered including a number of unsavoury and offensive self-published titles. In order to pull the titles, WHSmith replaced their entire website with a “site closed” notice showing a statement from WHSMith. They promised not to bring the website back online until these (handful) of e-books were no longer available. This kind of “dark site” is a not-uncommon web tactic for crisis management. A tactic where the normal website is replaced by a temporary, slimmed site, focused on providing information (on an ongoing basis) during the incident. This kind of tactic I’d expect to be used for corporate crisis management. Not to cover up the entire shop window whilst you pull a few items from your shelves. If you’re going to pull your entire site, then in some ways WHSmith did a reasonable job. They correctly configured the site to return a 503 Service Unavailable response code. This tells search engines (amongst other services) not to panic; don’t de-index and content, we’ll be back in a bit! Normally it’s used for short outages when you need to do some maintenance on a site and you can’t keep the website online during the process. It isn’t though, generally, used for days on end! The “site down” page clearly been based on a page prepared some time in advance. They almost certainly use a variation of this page during essential maintenance at times of the day when we’re all fast asleep and wouldn’t notice it. Anyone web manager knows the importance of analytics. Analytics during a crisis situation aren’t any less important! By taking down their website WHSmith created a weird blip in their data. 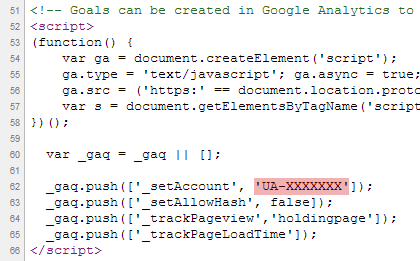 In the 503 page, there is a Google Analytics tracking script. Great! Unfortunately, it’s using a dummy account value (probably from when the template was first produced). This dummy value cripples the script and prevents any data from being collected. They’ve created an analytics black hole. Their analytics just flat-lined. I think that WHSmith have suffered from a combination of shortcomings during their initial handling of this incident. The incident has happened during a weekend. Always challenging to get hold of the right people at short notice. Their back-end system is clearly lacking a simple way of quickly managing items syndicated from Kobo. Management have shouted very loudly. Management lack the necessary digital knowledge and insight to sanction a smarter crisis-plan, or the WHSmith digital team lack the necessary digital knowledge and insight to put forward a smarter crisis-plan to management. Their crisis management plan was not properly prepared or practised. If their backend-system or CMS wasn’t capable of removing the products, then there are other ways (at database level or server level) that you could stop the content from appearing. The key to successful crisis management is preparation and practice. You should draw up a list of crisis that could possibly affect your site and then work out a plan of action for each type of scenario. If you are running an e-commerce site, then it seems sensible that a possible scenario could be an abrupt product removal. It’s worth considering a number of extreme examples (and look for examples of other crisis that have happened in the past and think about how you’d handle it on your site). Crisis management normally focuses around communication and information – such as preparing a “dark site” (or “dark section”) ready to be published in the event of a crisis, but as web managers we need to consider scenarios of a more technical nature too. Once you have a list of crisis scenarios and plans to address them, get practising! Make sure you find time for a run through at regular intervals to make sure everything is understood and in order. Believe me, management will thank you if you end up with a plan that can remove some books from your website without closing it for days and losing hundreds of thousands in revenue in the process. Dan Barker has just pointed out to me that WHSmith have at last corrected their GA script and changed the dummy account ID to their real account ID of UA-533522-1. David Moth gives a good write up of some of the knock-on effects of the site’s downtime, the broken analytics code and other missing forms of tracking. At 15:00 BST I noticed that WHSmith had come back online after being down for 5 days. Presumably it will stay online, although at this point I’ve not seen any official annoucement. Their Twitter account is still silent. James Royal-Lawson+ is a freelance web manager with over 15 years of experience and based in Stockholm Sweden.